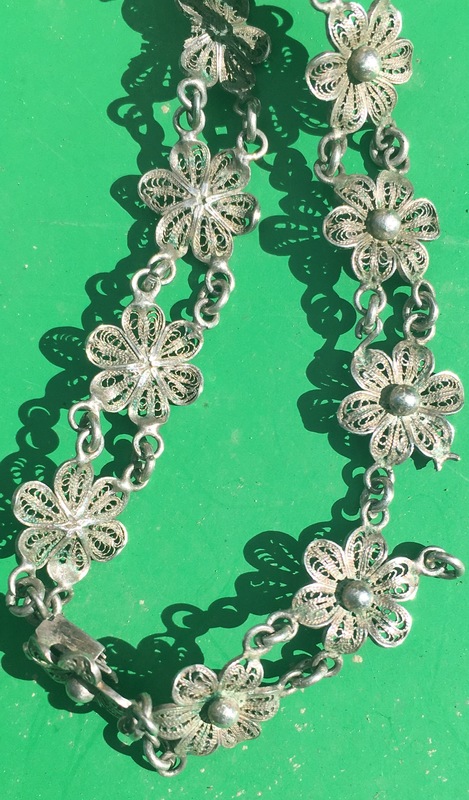 Brocantes, Silver & an antique Musket! 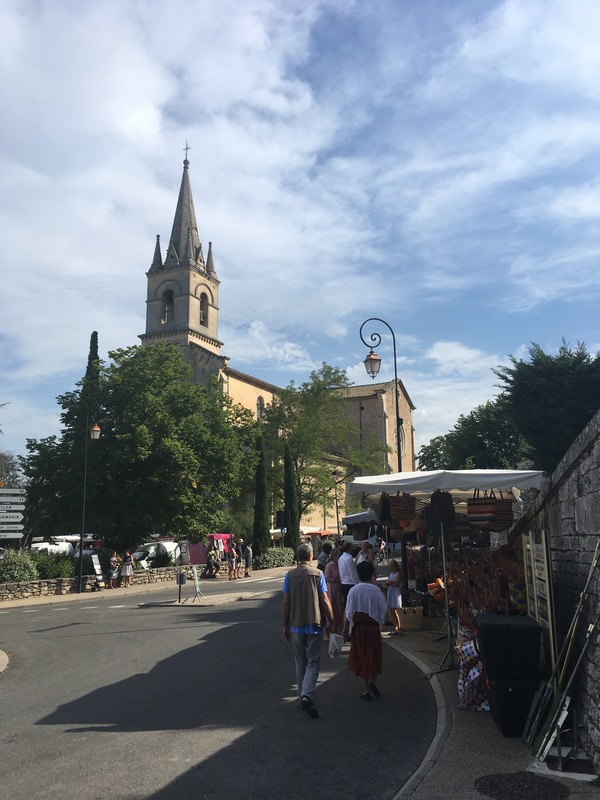 Saturday morning saw us driving across to the the far side of the Rhone and the lively, weekly brocante market in Villeneuve-Lès-Avignon. The market takes place every Saturday morning (come rain or shine) and is held in the car park at the bottom of the town, with stalls spilling onto the roadside too. 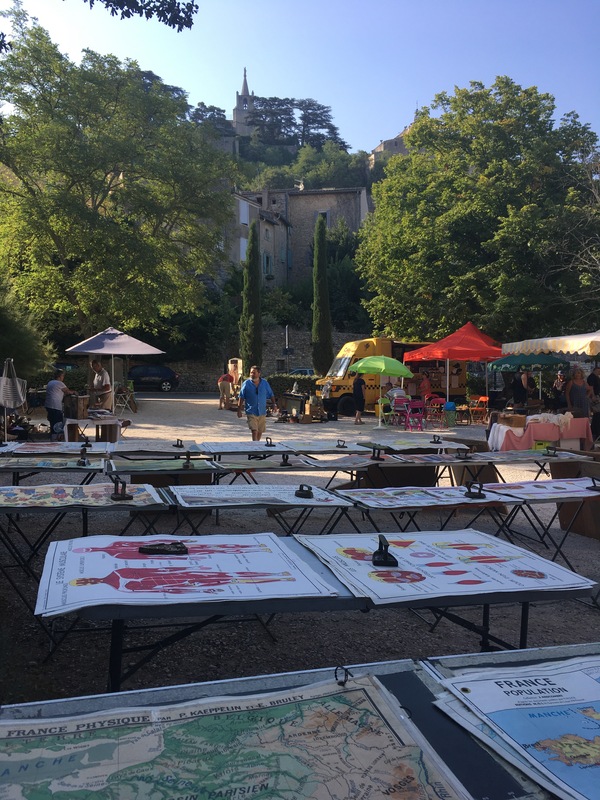 It’s a really picturesque setting, below the old Chateau, with a great range of stalls offering everything from furniture & paintings to weapons and dolls, which always make me shudder, especially when there are just boxes of heads or arms! Parking isn’t particularly easy, although we managed to find a space in the car park alongside the road in what is effectively a bit of a free-for-all parking zone with cars and vans parked at all angles and the ever-present risk of being blocked in! Arriving relatively early is always nice as it’s quiet and not too hot, so you really don’t mind a slow amble, browsing what’s on offer. 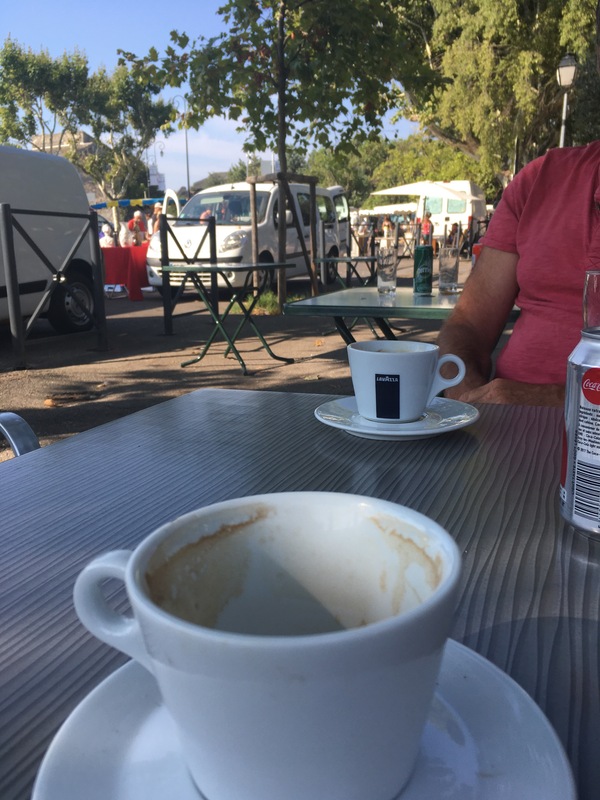 It also means there’s space in the little snack bar at the back of the market, which does excellent coffee (although wine is available too) and croissants, so is a perfect place for breakfast. We ambled round quite happily for nearly 3 hours, me hunting for silver to use for my jewellery and Tom & Andy looking at the militaria that was on offer – from WW2 uniforms to a wonderful Flintlock Blunderbus. Tom’s fascinated by Military History and is constantly reading up on it & researching facts & will be continuing his interest when he returns to start his History ‘A’ level at College in September, so he was very animated with what he had found. 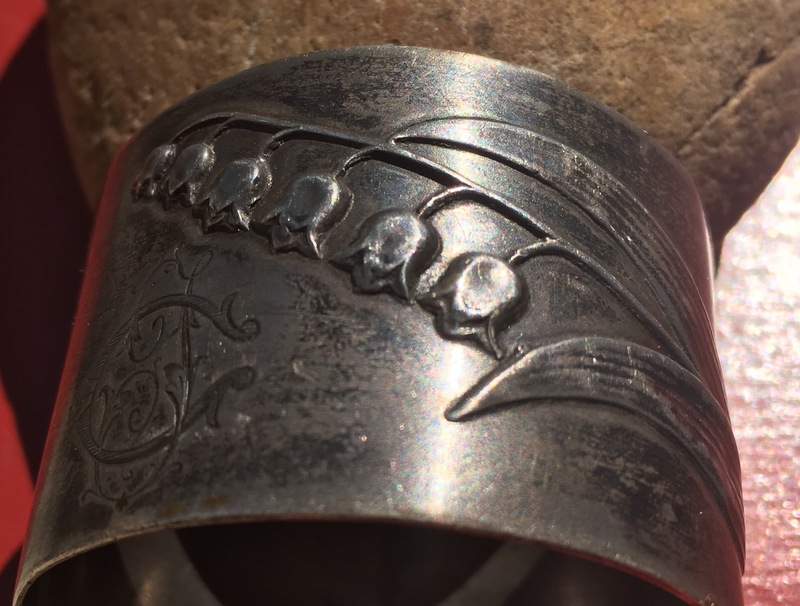 I had a successful morning and was delighted with my finds, especially the beautiful napkin ring, embossed with Lily of the Valley, which will become a nice cuff bracelet……..
And the silver-gilt salt spoons…. The boys however left empty-handed, as 400€ seemed a bit of an outlay for a gun! 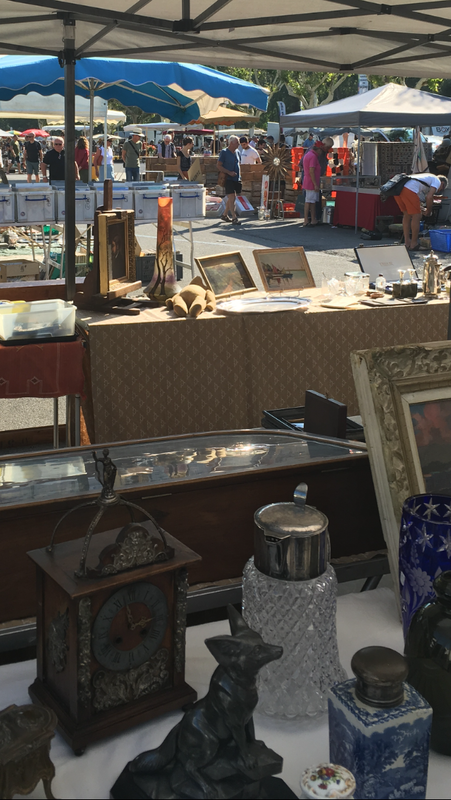 It did though spark Tom’s interest even more and we were delighted when he said he’d get it early on Sunday too to come with us up to the Vide Grenier & Brocante at Bonnieux. 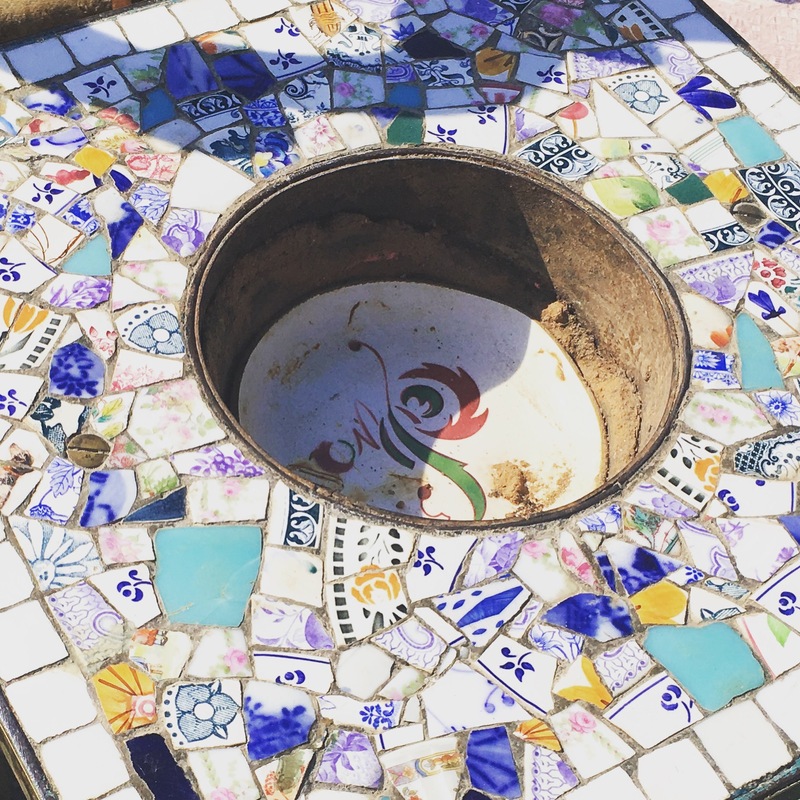 So Sunday morning we drove the winding road from Apt to Bonnieux to see what we could find. Again this is a nice event, not the ‘Belle Brocante’ that was held in the village a couple of weeks ago, but a bit of a mix with some good Brocante stalls and some more ‘car boot’ type stalls. After breakfast on the pretty terrace of Le Terrail at the side of the main square we started to fuddle around & it wasn’t long before I realised I’d lost the boys and walked back to see where they had stopped. I should have guessed really as I found them looking at some militaria and a gun in particular. Now, to be honest, I don’t really like weapons, but Tom was holding what was clearly a very old musket that appeared in reasonably good condition and was very keen to buy it and research its history. More research to be done on the musket! There is something great about having an enthusiastic son, as he was immediately talking about it being a French weapon and from what he already knew of the design, probably made before 1850. Things then took a rather bizarre turn when he was carrying the musket back towards the car. As he walked out of the Market he was approached by an old chap who started chatting to him about the gun saying it was a ‘joli fusil’ and was ‘très vieux’. Andy asked if he thought it may have been used for ‘la chasse’, but he exclaimed ‘Non!’ it was certainly a military weapon. He then asked to take a closer look and held the gun up as if to take a shot, moving around as he did so. It was at his point that I noticed people starting to move (understandably, very quickly) out of the way as the barrel was swung in their direction. He was just focused on the gun & was clearly not thinking about what was going on around him as he then cocked the hammer & now pointing it towards me pulled the trigger. Now I’m not a nervous person, but I must admit I was a bit shocked to find myself staring at an antique musket with someone pulling the trigger! Happily I’m still here to tell the tale and equally happy to say that the original engineering still works, although I think more than one person at the Brocante quickly changed their direction to avoid the swinging barrel! Looking back at it now, it was almost a bit like a scene out of a Laurel and Hardy film! The old chap handed the gun back, saying it was a good weapon & that Tom had got it for a good price too, before we went (quickly) back to the car and headed home to hang the musket on the wall. 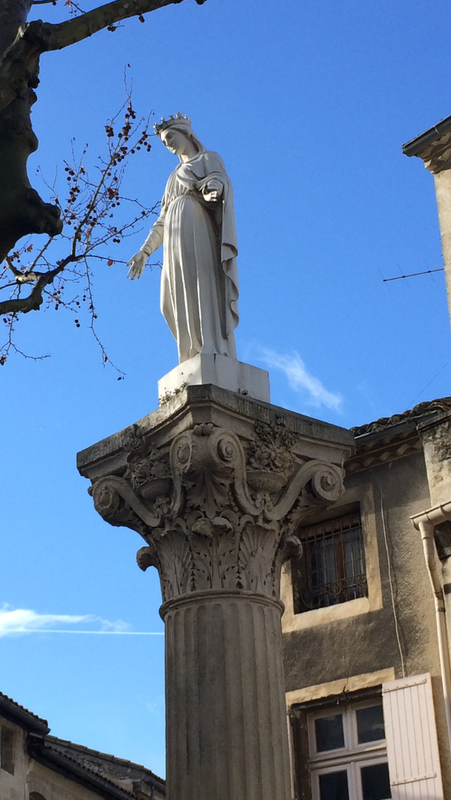 Since then Tom has done more research & tomorrow we’re heading to the Musée de L’Empiri in Salon-De-Provence http://www.salondeprovence.fr/index.php/emperi to see what else we may be able to find out about it. Bonnieux at its peaceful best! In the meantime the people in Bonnieux can walk in safety again!